6/13 Cup of Coffee: As the world celebrated Superman Day, Matt Kent (pictured) turned in a performance worthy of his namesake's alter ego. Meanwhile, Chandler Shepherd and Bryan Mata were both picked up after solid starts by outstanding bullpen efforts that enabled a pair of come-from-behind victories. After trailing all evening, the PawSox plated three runs in the ninth inning to come from behind. Ivan De Jesus doubled for his second hit of the day to lead off the ninth, setting off a wild inning that included three walks, a wild pitch, and a throwing error. The rally made a winner out of Ty Buttrey, who has been outstanding in recent weeks. It was the eighth consecutive scoreless outing for the righty, and he has only one earned run allowed in his last 12 appearances. Starter Chandler Shepherd was solid, giving up three runs on five hits in five innings. A nine-game hitting streak came to an end for Rusney Castillo, but the right fielder did add a walk. It was Castillo's sixth free pass in his last seven games, after walking only seven times in his previous 51. 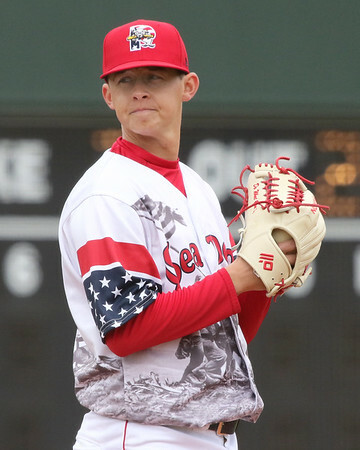 June 12 is Superman Day, and appropriately it was Matt Kent who took the mound for Portland. Flying Squirrels were no match for the superhuman offerings of the left-hander. Kent channeled his inner Kal-El by withstanding five hits over seven scoreless innings, striking out five, walking one, and of course never hitting anybody. Unfortunately, the offense and bullpen were both kryptonite. Kent left with a 1-0 lead despite the Sea Dogs garnering only three hits, but Richmond walked off with a pair of runs in the ninth. Like the Pawtucket and Portland games, this one was won by a rally from a team trailing all night until it reached the ninth inning. Salem scored single runs in the eighth, ninth, and 10th innings, with Roldani Baldwin driving in the winning run. Brett Netzer was the key cog in the Salem lineup. The second baseman had an RBI single in the eighth and singled as part of the winning 10th-inning rally as part of his 4-for-5 evening. Ryan Scott had a pair of doubles, and Bobby Dalbec added two hits. On the mound, Bryan Mata continues to tantalize. The 19-year-old righty struck out eight batters, a new career high, while allowing just one run on three hits in 5 1/3. However, control continues to be an issue, as Mata walked six, also the most of his pro career, giving him 40 free passes allowed in 46 1/3 innings. Yankory Pimental allowed one unearned run in 2 2/3 of relief, followed by Matthew Gorst getting the win with two scoreless frames. Gorst has allowed an earned run in only three of his 19 appearances. After a string of very strong outings, Alex Scherff struggled on Tuesday. The Braves reached Scherff for seven runs, including a three-run homer, on nine hits in two innings. Victor Acosta went 2 for 4 to record Greenville's only multi-hit game, while Samuel Miranda reached base three times with a single and pair of walks. The Red Sox1 lineup was kept at bay by the Astros, picking up only three hits, all singles, squandering some excellent pitching. Starter Kelvin Sanchez bounced back from a rough first outing of the year, as he allowed just one run on seven hits in five innings, striking out four against two walks. Yoelvis Guedez took the loss with a run in two innings, and Luis Colmenares fired a scoreless eighth. Angel Maita and Antoni Flores continue to key the lineup of the system's only above-.500 affiliate. The two international signees out of Venezuela had identical lines, both going 1 for 3 with a walk and a run scored out of the two and three spots in the lineup. Danny Diaz continues to clear the ducks off the pond, with seven RBI in nine games. Starter Carlos Veles struck out six in 4 1/3 innings while giving up just one run on six hits. Miguel Suero threw 2 2/3 and surrendered an unearned run to get credit for the win. Alberto Chrisotomo struck out four in his two scoreless frames. Player of the Day: It is both true and just that Matt Kent earns this recognition strictly on merit. The Texas A&M product has flown under the radar as a bright spot on the Sea Dogs pitching staff. With the seven shutout innings, Kent lowered his ERA to 2.95. In 55 innings, he has a Portland-best 61 strikeouts and only 16 walks.